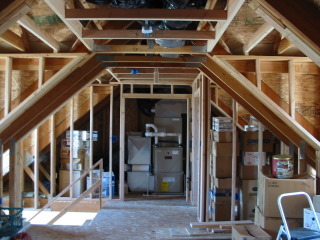 This large unfinished attic needed extensive framing in order for drywall to be applied to the ceilings and walls. This is a photo of the same view with the framing added. 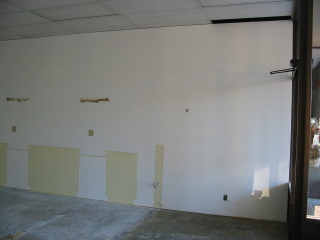 This is another photo prior to adding framing for drywall. 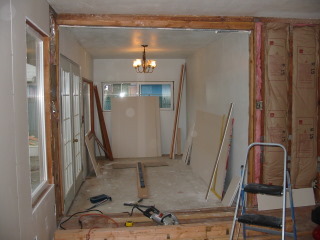 This photo shows the same view with the framing added to accept drywall. 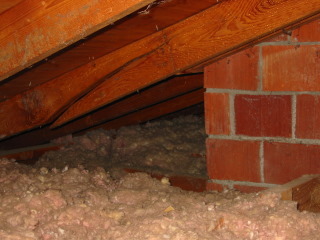 The rafter nearest the chimney was broken and allowed the roof to sag. Here the split has been repaired, and a backup support added. 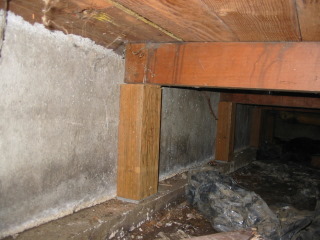 This house had a post-and-beam construction under the house. 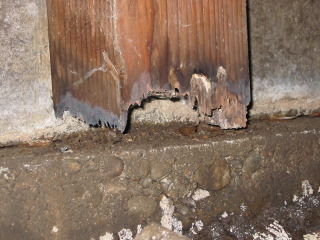 Water leakage between the foundation wall and footing rotted the bottoms of about a dozen of the posts. Here you can see that the house was holding up this post, rather than the other way around. 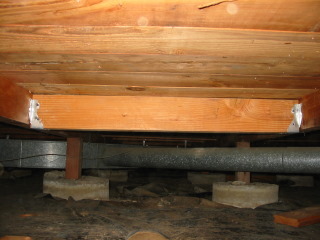 Beams were jacked slightly to allow a tight fit of the new, pressure-treated posts. Even with pressure-treated lumber, I put a composite shim under the bottom of the post, knowing that the water problem may continue. This is the floor system in a garage conversion. 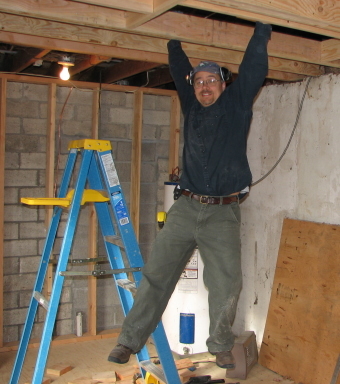 Here I'm doing some quality testing of the ceiling joists in the vicinity of the rough opening for an attic ladder. 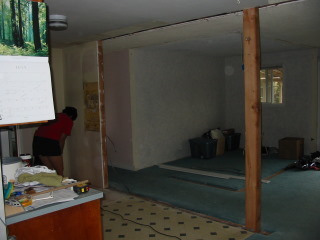 Wall framing can be seen in the background. 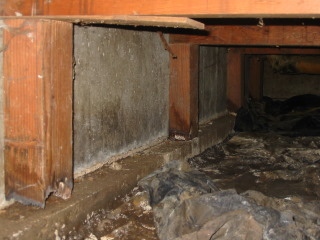 This is the load-bearing wall next to the original kitchen. 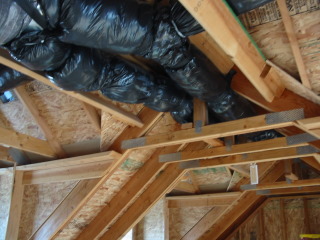 This attic beam was installed to hold up ceiling joists to allow removal of the load-bearing wall. 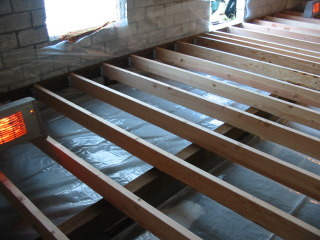 This underfloor framing was installed to support the subfloor where the new span endpoints tranferred weight to the floor. 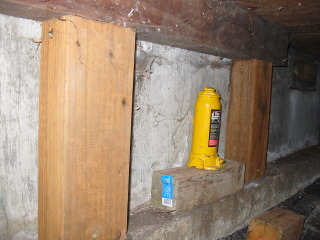 Here the wall is removed and the single post visible holding up the attic beam (above) as well as a previous beam running in the opposite direction. 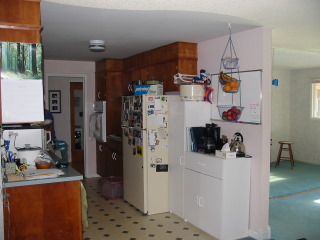 This area was later finished with new cabinets, counters, and appliances; cladding on the post; new flooring; new lighting; and new ceiling texture. 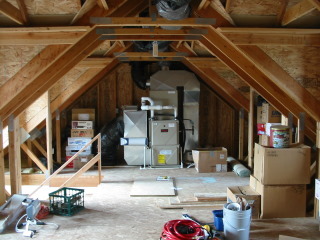 were specified by an engineer to handle the additional load of solar panels on this roof. The owner was going to have the house reroofed and wanted a straight ridgeline for the new roof. 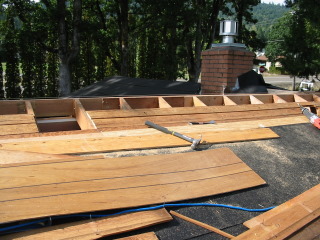 I didn't get a "before" photo for this job, but here is the removed ridge board, which you can see has a bow of 1.5-2 inches in the middle, making for an unattractive ridgeline. 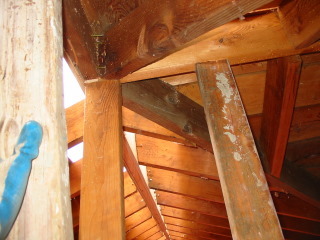 What you probably can't see are the three saw cuts nearly 3/4 the way through the ridge beam, which may have had something to do with the sag. 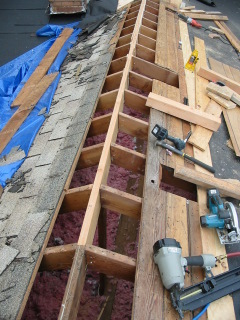 Here the new ridge board (about 20 ft) is already installed. 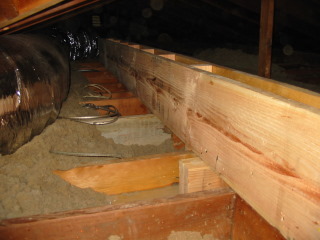 The rafters were jacked and braced while the ridge board was removed and new board installed. 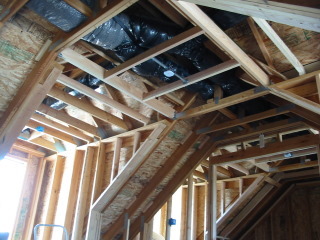 Then the rafters were gently let into place and fastened. 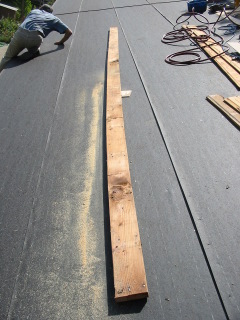 You can't really see the string line in this photo, but the new ridge is very straight. 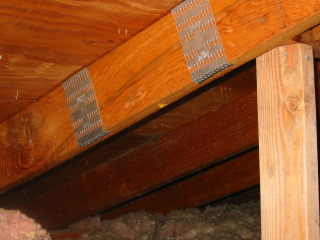 New braces were installed in the attic to keep the new straight ridge board in place over time. 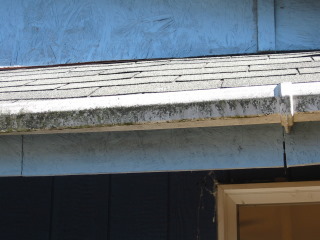 This Dutch gable (or hip and gable) roof had some troubles on the lower slope (eaves) below the gable. 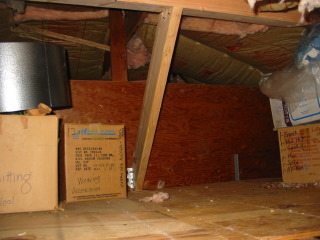 The short rafters were not holding their weight, causing the roof to dip 8 inches below level in some places. 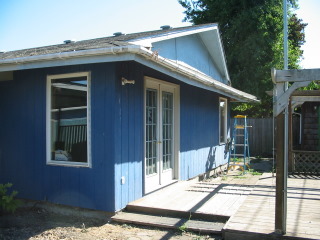 In addition, someone had used OSB (oriented strand board) for siding, facia, and rake trim at this end of the house. Yes, OSB. At least they painted it! 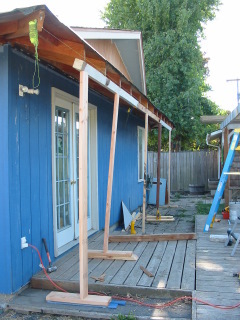 First we lifted the rafters to level with each other, and added under-eave support and facia to keep them there. 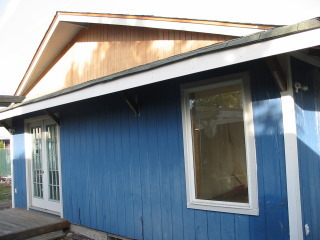 Then we added new siding under the gable as well as new rake and trim boards. Doesn't it look straighter now? It'll look even better when it's painted! 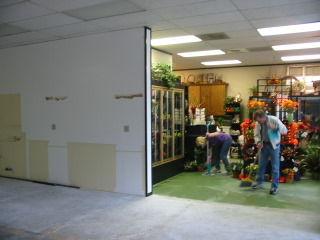 This small business leasing this space wanted this wall pulled back to join the two sections of the building. With the proper permit and permission from the owner of the building, we pulled it back as you see here. While renovating this house I came upon this "header" that was made of a 2x4 on its face, above some boards nailed together...spliced in the middle! 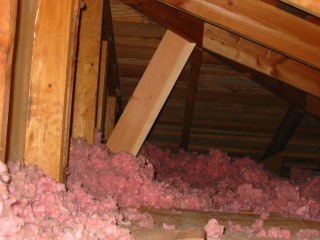 No wonder the ceiling was a little pot-bellied! 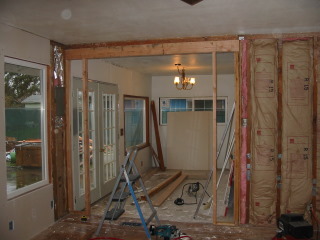 I installed a standard header for this opening and brought the framing in a bit to give more distinction to the room. 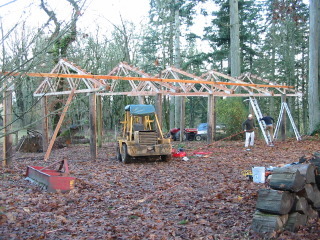 Here we assisted the home (farm) owner in getting the truss and supporting framing up for his replacement equipment shed (his old one blew down).